Dr. Strangelove or: How I Learned to Stop Worrying and Love the Bomb (better known as only Dr. Strangelove) is a 1964 British-American black comedy movie directed and produced by Stanley Kubrick, and starring Peter Sellers. The story concerns an unhinged United States Air Force general, George C. Scott as General Buck Turgidson. He orders a first strike nuclear attack on the Soviet Union. It follows the President, his advisers, the Joint Chiefs of Staff, and a Royal Air Force (RAF) officer as they try to recall the bombers to prevent a nuclear apocalypse. It separately follows the crew of one B-52 bomber as they try to deliver their payload. 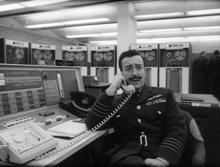 Dr. Strangelove, the President's Scientific Adviser in the War Room. This role is the key to the film's success. Strangelove, a wheelchair-using former Nazi scientist, has become a naturalized U.S. citizen. His former role slips into the film via his right arm, with its black-gloved hand. 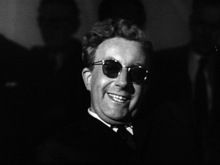 The arm persists in giving the Nazi salute, and Strangelove occasionally refers to the President as Mein Fuhrer. The accent is a brilliant copy of such German-origin Americans as Edward Teller, the "father of the H-bomb". President Merkin Muffley, played as a decent midwesterner, such as Adlai Stevenson. Group Captain Lionel Mandrake of the RAF, one of the minor roles. During the movie's ending, the world is blown up by a Soviet deterrence weapon, the Cobalt-Thorium G "doomsday machine", whose existence had not been announced. Vera Lynn's recording of "We'll Meet Again" is played as the world meets its end (it was a famous song of World War II). This is sometimes said to be a film of the book Peter George's thriller novel Red Alert (1958). But in this book Strangelove's character does not appear. It seems the director Stanley Kubrick had intended to use ideas from the book, but as the film developed the influence of tragi-comedy and the genius of Peter Sellers changed its direction. In 1989, the United States Library of Congress chose this movie to be kept in the National Film Registry. This means the movie will be protected from damage that happens to older film that was used to make movies. ↑ "Dr. Strangelove". British Board of Film Classification. Retrieved September 9, 2015. ↑ 2.0 2.1 "Dr. Strangelove or: How I Learned to Stop Worrying and Love the Bomb (1963)". British Film Institute. Retrieved September 9, 2015. 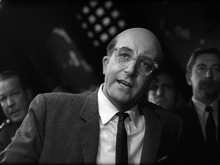 ↑ 3.0 3.1 "Dr. Strangelove or: How I Learned to Stop Worrying and Love the Bomb (1964)". Box Office Mojo. Retrieved September 9, 2015. This page was last changed on 8 April 2019, at 02:18.